The Palestinian BDS National Committee (BNC), the broadest coalition in Palestinian civil society, has offered its congratulation and thanks, to both the Presbyterian Church (USA) and the Unitarian Universalist General Assembly, for their respective and powerful votes, in the weeks past, towards advancing solidarity with Palestinian rights under international law within faith communities in the United States. Majorities of both denominations’ general conferences expressed strong support for nonviolent measures to uphold Palestinian human rights and end Israeli injustices against the Palestinian people. Economic measures against Israel’s occupation have been adopted also by the United Methodist Church, United Church of Christ, Quakers, Mennonite Central Committee, the Catholic Conference of Major Superiors of Men, and the Alliance of Baptists. The Presbyterian Church (USA) assembly expanded upon its historic 2014 decision to divest from US corporations profiting from Israel’s occupation and violations of international law, by recommending to the Presbyterian Foundation and Board of Pensions to refrain from investments which support violence against both Palestinians and Israelis. Furthermore, it was decisively voted to prayerfully study the BDS Call, issued by the absolute majority in Palestinian civil society in 2005, and to engage with its authors and sponsors. The Presbyterian Church (USA) assembly overwhelmingly called on Israel to end its gross mistreatment of Palestinian children and on Re/MAX to follow through on a recent promise to stop profiting from sales of homes in illegal Israeli settlements. It also called on U.S. Congress to hold hearings on the use of U.S. military and police equipment by the Israeli government. The Unitarian Universalist General Assembly majority (54%) voted to endorse the Unitarian Universalist Association’s recent divestment from companies complicit in Israeli apartheid. While falling short of the 2/3 majority needed to pass the resolution, this majority vote showed clear support for the church’s prior action to divest from companies profiting from Israeli occupation and apartheid. 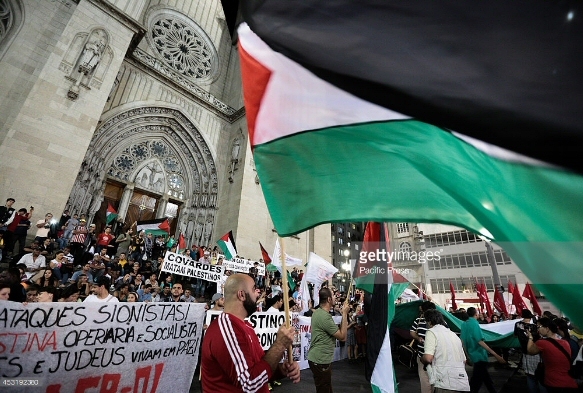 Other faith communities that have adopted economic measures against Israel’s occupation in the last 2 years include the United Methodist Church, United Church of Christ, Quakers, Mennonite Central Committee, the Catholic Conference of Major Superiors of Men, and the Alliance of Baptists. Original article at BDS official.